The use of robot-assisted techniques in the performance of surgery has been one of the most important developments in surgery in recent decades. The US FDA approved the robot-assisted surgical system for gynecological conditions in 2005, and currently gynecological together with urological are the most common surgical procedures performed with the Da Vinci® robot. In essence the robot system allows a surgeon to operate from a location remote to the patient, which allows improved accuracy, precision and a more comfortable operating position for the surgeon. However, robot-assisted surgery presents new challenges for anesthesiologists including patient positioning, as well as adverse effects on pulmonary, cardiovascular and neurological systems. 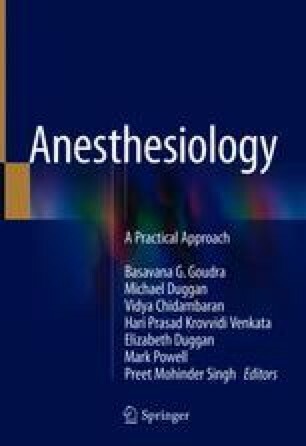 The current chapter highlights the most important anesthesia related issues during robot-assisted surgery during the preoperative, intraoperative and post-operative phases. Recommendations are given for patient positioning, intraoperative management and post- operative care. Potential intraoperative emergencies are discussed and a protocol for a standardized ‘undocking’ procedure is described. Medical Robotic Systems Market (Surgical Robots, Non-Invasive Radiosurgery Robotic Systems, Prosthetics and Exoskeletons, Assistive and Rehabilitation Robots, Non-Medical Robotics in Hospitals and Emergency Response Robotic Systems) - Global Industry Analysis, Size, Share, Growth, Trends and Forecast 2012–2018. 2013. http://www.transparencymarketresearch.com/medical-robotic-systems.html. Accessed May 2017. Avondstondt AM, Wallenstein M, D’Adamo CR, Ehsanipoor RM. Change in cost after 5 years of experience with robotic-assisted hysterectomy for the treatment of endometrial cancer. J Robot Surg. 2017. https://doi.org/10.1007/s11701-017-0700-6. Standards for Basic Anesthetic Monitoring. 2010. http://www.asahq.org/~/media/Sites/ASAHQ/Files/Public/Resources/standards-guidelines/standards-for-basic-anesthetic-monitoring.pdf. Accessed May 2017. Patient Safety. http://www.who.int/patientsafety/safesurgery/en/. Accessed May 2017.